From 1713, her married name became Smith. Margaret di Savoia was born in 1439.1 She was the daughter of Ludovico I Duca di Savoia and Anne de Lusignan, Princess of Cyprus. She married Giovanni IV Paleologo in December 1458.1 She married Pierre II de Luxembourg, Comte de St. Pol, son of Louis de Luxembourg, Comte de St. Pol and Jeanne de Bar-Mousson, Comtesse de Marie et de Soissons, after 29 January 1464. She died on 9 March 1483. [S5549] Sarah Smith, "re: Beaumont Family," e-mail message to Darryl Roger LUNDY (101053), 11 July 2011. Hereinafter cited as "re: Beaumont Family." Margaret de Chambley was the daughter of Ferri de Chambley, Seigneur de Chambley. She died circa 1456. 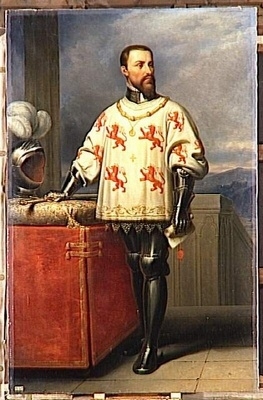 Ferri de Chambley, Seigneur de Chambley gained the title of Seigneur de Chambley.